Live Texas Hold'em Bonus Poker - Rules,Strategy and where to play guide. 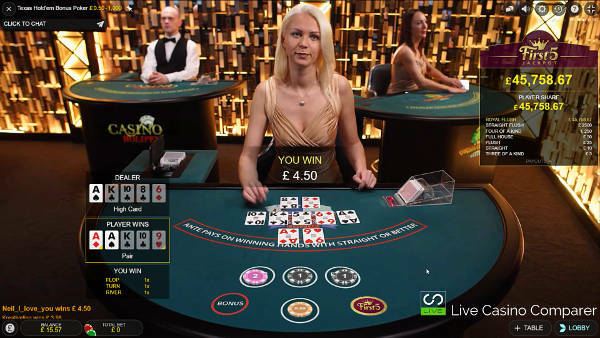 Live Texas Hold’em Bonus Poker is another variant of Texas Hold’em, and has been adapted as a table game for land based casinos and now for online live casinos. Scientific Games has the rights to the game and has developed in partnership with Evolution gaming, Live Texas Hold’em Bonus Poker. So What is Live Texas Hold’em Bonus poker? It a game that’s played with one deck of 52 playing cards. The aim of the game is to get a better 5 card poker hand than the dealer. If you manage to do this you’ll win and the dealer will pay you. The amount depends on how much you’ve bet and also the value of the hand you win with. You can also receive a payout for a losing hand if you are playing one of the side bets. The absolute genius of this game is the ability for you to build your bet as each new card is dealt. These betting rounds are optional and you can chose to just play your initial bet if you feel your dealt hand is not going to be a winner. It’s the only live table game where you have to make a betting decision as each new card is dealt. That’s unique and keeps your interest in the game right up to the end. With Live Texas Hold’em bonus poker only one player hand is dealt. An unlimited number of players can play and bet on the hand. The outcome of Dealer or Player win will always be the same. The impact to you the player is determined by how you’ve bet. No one else’s decisions affects the way you played the hand. To start the game the Player needs to make an initial Ante bet. Two optional side bets, a Bonus Bet and Progressive Jumbo 5 can also be made. The dealer deals two cards to the Player position face up, and two cards to the dealer position face down. The player can either make a 2 x Ante bet to pay the hand, or chose to fold and take no further part on the game. NB. The Bonus Side bet is still active for those first two cards even if the player folds. The dealer then deals 3 Flop cards face up. The player can chose to Bet again, which is 1x the Ante, or Check to continue without betting. The dealer then deals the Turn card face up. The player can bet 1x the Ante or Check. The dealer then deals the River card face up. The dealer then reveals his two cards and both the player and dealer make the best 5 card poker hand they can from the 5 community cards and the two cards in front of them. If the dealers hand wins, then the Ante and play bets are lost. The side Bets remain and are paid at the end of the game. If the Dealer and Player hands are the same, all bets are pushed and returned to the player. The bonus side bets are settled at the end of the game. If the player beats the dealer, the Flop, Turn and River bets are paid at 1:1. The Ante is pushed, unless the winning hand is a straight or greater, where it will be paid at 1:1. The Bonus side bet will get paid regardless of the outcome of the main hand. You place the bet at the beginning of the game round before any cards are dealt. Unlike other Poker game side bets, the winning hands are not Poker valued hands, but combinations of high valued hands for the player and/or dealer combined. Ace – Ace (For both Player and Dealer) pays 1000:1. Ace – Ace (For just the Player) pays 30:1. Ace – King (Suited) pays 25:1. Ace – Queen or Ace – Jack (Suited) pays 20:1. Ace – King (unsuited) pays 15:1. King – King or Queen – Queen or Jack-Jack pays 10:1. Ace – Queen or Ace – Jack (unsuited) pays 5:1. This optional side bet is a Progressive Jackpot and is seeded by all casinos that take the side bet. It pays out on the players first two cards and the flop. The top prize, a Royal Flush is shared between all the players playing the side bet at the table. The other prize hands are paid directly to each player. Four of a Kind pays £250. Three of a Kind pays £3. For the initial two cards dealt you should fold any unsuited hands that are valued between 2-3 and 2-7. If they are suited you can play them for the potential of a flush. The RTP for the main game is surprisingly high achieving an RTP of 97.96% and 99.47% based on the total bet for the main game. The Bonus bet is less kind with an RTP of 91.46%. For those chasing the Jackpot the RTP for one of the prizes is 81.84%. Don’t expect to win anything soon is the message here! Live Texas Hold’em bonus poker can be play live online at Evolution Gaming Casinos only. You won’t find the game anywhere else if you want to play with a Live Dealer.